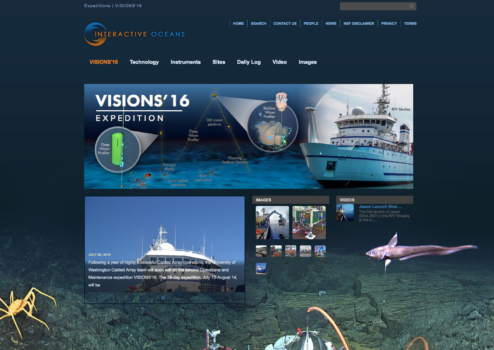 The VISIONS’16 website features daily cruise logs, videos and an image gallery. On July 10, the R/V Sikuliaq left dock at the University of Washington to begin VISIONS’16, a 39-day mission to replace and maintain elements of the Cabled Array off the coasts of Oregon and Washington. Led by Chief Scientist Deb Kelley, this is the second Operations and Maintenance cruise for the Cabled Array implementing organization, as part of the National Science Foundation’s (NSF) Ocean Observatories Initiative. During the cruise, scientists from the University of Washington School of Oceanography within the College of the Environment and engineers from the Applied Physics Laboratory will visit all of the Cabled Array sites where they will recover, install, and test over 100 instruments and nine junction boxes. They will also recover and reinstall the Deep Profiler Moorings at the Endurance Offshore and Slope Base sites. The remotely operated vehicle (ROV) Jason will also assist in the recovery and installation of the underwater infrastructure. This is Jason’s first time supporting the Cabled Array, which required special modifications to be made to the ROV over the past year. The three legs of the cruise will run from July 10 to August 15, 2016. You can learn more about the cruise on the VISIONS’16 website, which includes daily cruise logs, as well as image and video galleries. You can also follow along on Twitter (@VISIONSops), where up-to-the-minute updates about activities on board are posted.